Slate roofing is an upscale, artistic choice for homes and businesses, due to its natural beauty, durability and sleek architectural look. And while slate roofs typically require minimal maintenance, your slate tiles may need occasional repairs. Frequency of repairs depends upon the mineral properties, fabrication method, installation techniques and inspection schedule of your New Jersey roof. However, broken, cracked or deteriorating slate tiles should be promptly repaired or replaced in order to prevent interior damage, structural degradation or attic moisture buildup. Remember that, if you’re unsure about the extent of the slate damage, it’s best to hire a qualified NJ roofing specialist to inspect and repair your slate roof. This is especially important since the most common reason for slate roof failure is improper repair. There are several things to remember before inspecting a problematic roof or installing new slate on your home. As with many other types of roofing, good flashing is essential to protecting your home from the top down. Your slate tiles may be leaking because of poor flashing quality or improper flashing installation. As you’re inspecting your roof, take note of the flashing type. The best flashing for a slate roof is copper, since tin-plated and galvanized steel do not last as long. If you’re installing a new slate roof, consider paying the small difference for quality copper flashing. 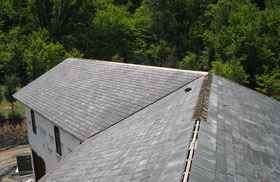 If you believe that your existing flashing is damaged—especially in valleys, around vents or along chimneys, it’s best to enlist the help of a slate roofing professional, since these flashing areas can be difficult to repair. Some slate roof leaks may be caused by rusty nails and fasteners. Again, if you have the option, select copper or stainless steel nails when installing or repairing slate roofs and new flashing. Galvanized nails can rust within 30 years, and your roof may develop a leak at the rust site. Consider track systems. When slate roofs are installed with nails, there is always a chance of pinching or damaging tiles. New track systems allow adequate venting between the slate and the roof – and make it easy for the slate to be installed without nails or screws. Since slate is made of natural stone, and stone can have invisible fracture lines, it’s important to be especially careful when you’re climbing on the slate roof. Many homeowners have unknowingly damaged or cracked their slate tiles by carelessly stepping on them. Once a slate tile is cracked, a freeze cycle can split the tile beyond repair. Finally, it’s important to note that all slate is not the same. If your home’s roof was selected by a previous homeowner, they may have chosen cheap slate tile without a proven performance track record. Slate roofs are an investment in the future of your home, and should be chosen carefully if you have the opportunity to choose the roofing material, yourself. 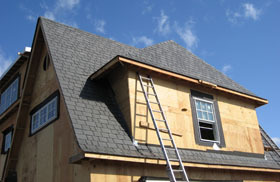 If you’re ready to add a new slate roof, or replace one that’s aging or in disrepair, contact LGC Roofing – we specialize in slate roofing installation in NJ. We’ll meet with you to discuss materials options and determine a high-quality roofing material that fits your budget and your home’s design. 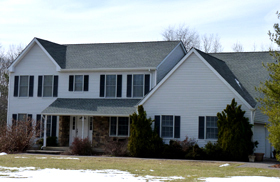 Request your free slate roofing installation estimate today!